Regardless of the cell type harboring them, linear replicons encounter the problem of avoiding shortening of the termini during each replication round. In eukaryotic chromosomes the telomerase, a ribonucleoprotein with reverse transcriptase activity, adds telomeric repeats copied from an internal RNA template onto the ends of the chromosomes (Greider and Blackburn 1985, 1989). Another strategy to maintain size is brought about by covalently closed DNA ends, as in some prokaryotic and eukaryotic linear DNA elements (see Chapters in this volume by Kobryn (2007), Hertwig (2007), Galligan and Ken-nell (2007), Hashiba and Nagasaka (2007)). The majority of fungal and yeast linear plasmids employ a replication mode using protein priming, thereby facilitating full replication of termini. 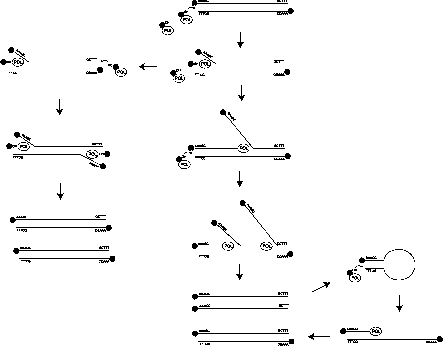 In addition to the protein primers, which remain covalently bound (terminal proteins, TPs) to the 5' ends of the newly synthesized DNA molecule, all these elements have in common terminal inverted repeat (TIR) sequences resembling both linear genomes of bacteriophages and adenoviruses, suggesting a common mode of replication (Paillard et al. 1985; Kempken et al. 1989; Meinhardt et al. 1990). Indeed, the protein-primed replication mechanism is well studied in adenoviruses and bacteriophages, serving as a model for linear plasmid replication (reviewed by Challberg and Kelly 1982; Salas 1991; Meijer et al. 2001). 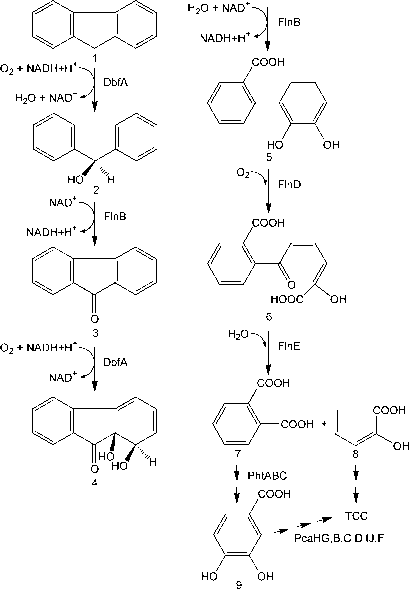 For Bacillus phage phi29, a serine residue of the TP acts as the replication primer by facilitating desoxynucleotidylation of the free hydroxyl group. Along with the TP, the phage-encoded DNA poly-merase forms an initiation complex at the second nucleotide of the TIR (Kamtekar et al. 2006). Subsequently, the TP-DNA polymerase complex slides back to the first nucleotide, starting elongation of replication and dissociation of the TP-polymerase complex (Mendez et al. 1992, 1997; Kamtekar et al. 2006). There are no internal origins of replication and the highly processive DNA polymerase is able to replicate the entire phi29 genome (Kamtekar et al. 2004). Though replication initiation may occur simultaneously at both ends, yielding two fully replicated copies, single-strand (ss) replication intermediates occur as well (Fig. 1). By hybridization of the inversely oriented TIR sequences such ssDNAs form so-called panhandle structures, providing a dsDNA end suitable for initiation of a novel replication cycle, eventually resulting in a fully replicated dsDNA copy of the genome (Fig. 1; Challberg and Kelly 1992). Such a replication mechanism realized in adenoviruses, bacteriophages, and linear plasmids led to the suggestion that not only do the bacteriophages and adenoviruses share a common ancestor, but also linear plasmids may have evolved from an archetypical protein-primed replicating genome some billion years ago (Davison et al. 2003). Interestingly, in both adenoviruses and bacteriophages, the replication module consists of the DNA polymerase and a separate TP encoding gene, which are, however, directly neighbored; in all linear plasmids from fungi and yeasts, a single open reading frame (ORF) encodes both the TP and the DNA polymerase (Meinhardt and Rohe 1993). Fig. 1 Protein-primed strand displacement replication. The linear element is schematically represented by two lines with TIR sequences (AAAGC/GCTTT). Filled circles indicate plasmid-bound TPs; POL represents the TP-DNA polymerase fusion protein; the hydroxyl moiety (OH) of an amino acid acts as the primer genes (see below), providing another clue for viral ancestry. As for the DNA polymerase, the RNA polymerase encoding gene is not necessarily found on each plasmid but is present at least once in each plasmid system (Kempken et al. 1992).